A man works on the road on State Route 89 in Emerald Bay earlier this year. 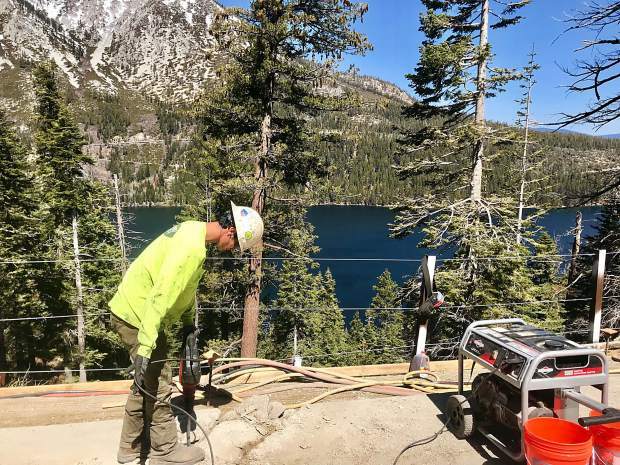 Environmental damage caused by an engineering company delayed a multi million-dollar project in the Emerald Bay area while also touching of an investigation by the Tahoe Regional Planning Agency. And now a former employee, who claims to have captured video evidence of the destruction, is mulling whether to bring a lawsuit alleging wrongful termination by the company. TRPA received a complaint on May 21 concerning the improper disposal of materials on California Route 89 by Emerald Bay, temporarily interrupting a project that involves building a 192-foot retaining wall along the northbound lane of the highway just south of Inspiration Point. Upon investigating the hillside where workers were throwing boulders and asphalt toward the waters of Emerald Bay, TRPA staff found damage to trees, the slope and a stream, according to TRPA’s Public Information Officer Tom Lotshaw. Robert Casebeer, a Tahoe local and former employee of Stewart Engineering — the contractor hired by the California Department of Transportation (Caltrans) — claims he was the only worker concerned with the environmental hazards. He said he filed the complaint with the TRPA after being terminated on May 13, which led to the investigation. Casebeer and his lawyer, Jacqueline Mittelstadt of Tahoe Law Center, are now considering filing a wrongful termination lawsuit against Stewart Engineering and Caltrans. In a video taken by Casebeer and posted to the White Trash Brigade Facebook page on June 6, heavy machinery can be seen dropping a boulder down the hillside while construction workers watch. The video had about 25,000 views as of June 13. In addition to the environmental threats, the Rubicon Trail, one of the area’s most trafficked footpaths, runs several-hundred feet below where the workers were throwing materials. Casebeer claims to be the only worker who showed concern over the damage. Caltrans District 3 Public Information Officer Steve Nelson refuted the claim that Casebeer contacted Caltrans. Casebeer was allegedly fired after telling his employer “he would no longer engage in illegal and unsafe conduct.” He was given no warning prior to his termination, according to Mittelstadt. Stewart Engineering could not be reached for comment, despite multiple efforts by the Tribune. Caltrans opted not to comment on Casebeer’s situation, but Nelson did confirm the damage to the slope. Caltrans sent an arborist to the site to evaluate the area after being made aware of the complaint and will do another assessment after the project is complete, which is scheduled for June 20, Nelson said. He did not know the specifics of the arborist’s observations, including the number of trees damaged and the extent to which the slope was destabilized. Following the TRPA inspection, project managers were asked to install proper erosion control measures, which was a requirement of the original TRPA permit. A cease and desist order also was issued, ordering Stewart Engineering and Caltrans to retain and properly dispose of all site materials. A follow-up inspection on June 7 found that the requirements had not been carried out and Caltrans and Stewart Engineering were given 24 hours to install the erosion control measures. The requirements were soon met and the project proceeded. The TRPA investigation is ongoing, so specific violations have not been determined, according to Lotshaw. Caltrans has a plan to plant sapling trees in the affected area and secure the slope, which is in review. The retaining wall is part of an overall $4.4-million project, which also included a new concrete barrier near Eagle Falls. UPDATE: This story has been updated to include a response from Caltrans regarding Robert Casebeer’s claim that he notified Caltrans about the violations.